As Navarathi/Golu season is coming nearby, thought of making the collection of sundal recipe that i had shared earlier,since sundal is the most common snacks prepared for the Golu/navarathri evenings . It's the most easiest prasadam that you can make in bulk and distribute to the friends and families who pay visit to the Golu in the house. Here is the quick recap of all the sundal and the most authentic sweet puttu from the scratch. 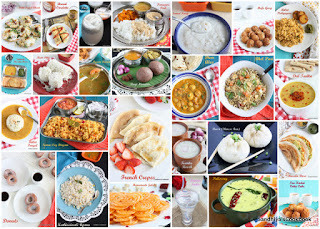 I know that the collection hasn't have lot of recipes, but it has the most common and easily prepared recipes,hope this helps to plan your navarathri prasadam menu in a small way.